It is sad, but I have come to realize that a reliable safe living together with my wolfhound Happy and the rest of my pack is not possible. I have to read the text on the wall. The other dogs accept him, but as soon as I take Happy to another room, they run out in the garden and start to play. Except one, my dogs no longer wants to be walked together with Happy. So I see no other way that we must part ways. 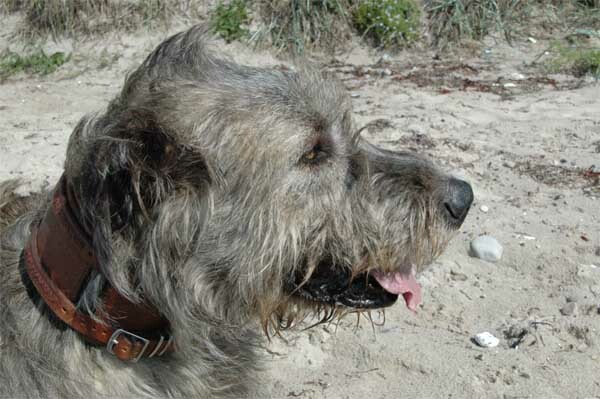 Happy is my male wolfhound, now 4Â½ years old. He has no pedigree, but both his parents were purebreed IWs. 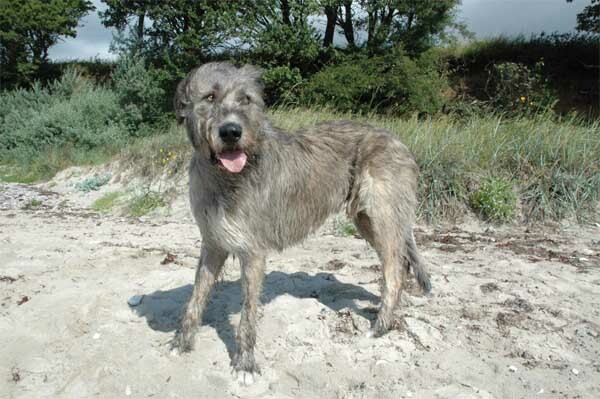 He weighs 58 kilos, and his shoulder heigth is 79 cm, which makes him a rather small irish wolfhound. His problem is that he has an intact hunt-and-kill instict that may trigger when somethings whine. My borzois, by their ubringing have learned to be whiners. A very submissive dog may cause him to consider it a prey. It is an instinct, and sometimes he manage to break out by an active thinking process just in time, but not always. On the other hand, he does not react adverse on normal acting dogs, or dogs that are self confident, no matter if they are male or female. I have even used him for training other difficult dogs, and he is able to ignore them barking at him. He reacts more to small whining dogs that lay on their back, or inbreed dogs that hadly cant walk anymore. Here the predator comes up in him. Happy ignores joggers, unless they react on him, then he think they want to cuddle. On a general term, Happy is not that much interested in other dogs, his attention is more aimed at humans. He is very contact seeking with humans, and love children. Where he may be somewhat clumsy with adults, he manages fine careful maneuvering with kids - he simply lays down, and let them come to him. Compared to other wolfhounds of that age, Happy is a strong boy who dont mind a 3 km run beside a bicycle - if the person on the bicycle is a circus artist who dont initial mind speeds at 40km/h. He have never had health issues other than self induced accidents that had to be repaired. Happy is very agile, and fond of activity, and has showed good learning abilities. He has been chemical neutered for the safety of my other dogs, that does have some effect in him being less disposed to bully my other dogs, but it causes contact with him to get more dificult, and it makes it hard to let him run offleash. He could that quite good earlier. As an intact dog, he tends more to bullying, but is easier to keep in contact with. Bullyin seems to be mainly limiited to his own dog pack. As a chemical neuterling, he does less bullying (but still doesnt leave it totally), but his hunting instinct is stronger, and contact more difficult. The current treatment expires at the end of this yearm I will leave the decision to neuter or not to a new owner, neither of the options are perfect, but it depends on the circumstances where Happy will be living. Generally, it could be exected that the current circumstances hwere, where the other dogs avoid him, has caused Happy some stress that may be the reason for some of the unfortunate reactions he has shown in the past year. Happy could live in a pack with one or more dogs, provided that they are mental stronger than him, and can tell him off. My female borzoi who weighs only the half of Happy can control him, and throw him in the carpet if he does not respect her. But he cant go together with wulnerable dogs, or dogs with epilepsy. I have never observed any unfortunate interpretation of crying kids, I have even spend hours with him in front of toy shops and ice cream bars, where some children cry their eyes out because they cant have... He never reacted the slightest. Nevertheless, no dog should ever be let alone with children, and I would warn about letting him see children with epilepsy. Happy requires very much human contact. Wherever I go in the house, Happy trots behind me. When I am at work in my workshop, he follows me and lay silent observing me while I work. He would not be fine with being alone too much, he can stay alone at home for some 4 hours without problems. Happy loves to sleep with his human in bed, and that means head on the pillow, breathing his owner in the face. Fortunately he soon gets too hot, and has to leave. He is fine with a practical joke and problem solving. He carries his name with good reasons, and people will see a happy dog, but there is a backside of the medal, and I have made it clear in what way. If I had no whining borzois, he could easily live here to the end of his days, but the borzois cant be rehomed. Happy can be rehomed, and will fit in where attention to his partiular problems can be provided, he will still be a nice dog and pleasant to live with. Where Happy will welcome everyone during the day, even a burglar who just lets him cuddle and lean, he is protective at night. I ask no fee for Happy, but the person/s who may want to adopt Happy must consult the trainer who have been with us on all this, and let her make sure they understand the possible safety issues with him, and they will pay her consulting fee. She understands and speaks english and german and danish of course.If she turns down the possible new owner, I will pay her fee. Happy will not be the ideal dog for an IW newbie, or someone who never havehandled large dogs. There will only be a direct contact between me and Happys trainer and the possible new owner. No organisations, no third party. I dont want important information to get lost in too many links, and I dont want anything to happen anywhere because of Happy. That decision is in stone and will not be changed. A rehoming of Happy has to take place, it will be better for all, but he can stay here until further. I will continue to train him impulse control, both to make living here eaier, and help a new owner in the way. Happy lives with me in southern Denmark. I recommend that you read these topics, where a lot reading about Happy is awailable. Happy in tunnel with a hat on his head. Yes/No excercise - essention for him. I reserve the right to change my mind on this, or make other decisions, if circumstances change.